Pope Francis has been named Time Magazine's ‘Person of the Year’ for 2013. He is the third Roman Pontiff to receive this honour after John XXIII in 1962 and John Paul II in 1994. “The decision didn’t come as a surprise given the great resonance and attention surrounding the election of Pope Francis right from the start of the new pontificate. The fact that one of the most prestigious awards to be attributed by the international press should go to someone who promotes spiritual, religious and moral values as well as call for peace and greater justice in an incisive manner is a positive sign. As for the Pope himself, he’s not someone who seeks fame and success, because he has put his life at the service of announcing the Gospel of the love of God for mankind. It is pleasing to the Pope that this service should appeal and give hope to women and men. And if this choice of ‘Person of the Year’ should mean that many people have understood this message - at least implicitly - the Pope is really happy about this." Pope Francis celebrated Mass in the chapel of the Domus Sanctae Marthae residence in the Vatican this Friday morning, focusing his remarks on the attitude of some Christians who seem to be “allergic” to preachers and overly critical of those who proclaim the Gospel, suggesting that they are often afraid of letting the Holy Spirit into their lives and are therefore prone to profound sadness. Praying through Mary is not expressly written in the Bible, it is rather an outcome of a mature understanding of the "Communion of Saints". 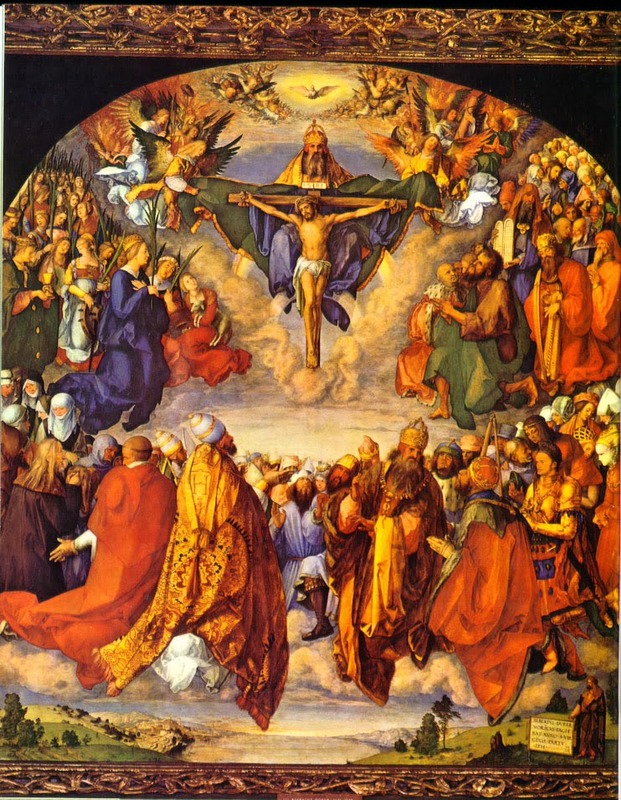 We the Church believe, as taught by St Paul, that "we are one body, one Spirit in Christ". To the mind of the Church, this has a certain literalness in terms of religious actions. So that when you do good, the entire body is healthy and is affected and when you sin, you affect the entire body. When you pray as well the other members (parts) of this body is equally affected. Christ came to the world as man and God, establishing his authority and dominion as Lord of the Living, both because he lived, died and resurrected. But also Lord of the dead because through this resurrection he conquered death. Since life springs from him only, and since he has walked the roads of the underworld, he himself has power that penetrates the grave. This power is also inherited by his Body the Church, so that she is never torn apart or broken by death. NO ! She is actually strengthened by the death of a faithful since her glory shines as more members are glorified. These glorified members since they are still attached to Christ's body also help in its nourishment. So that when they praise God by chants, or pray to Him, the effects reach the entire body; the effect reach you and me. So even without asking for it, the saints pray for us. And we can raise our hearts to them since we're bound; one body and spirit in Christ to aid us in our needs. 1. There are only 3 Persons in God. Father, Son, and Holy Spirit. 4. The Work within (Called: OPERA AD INTRA) is Father eternally begetting the Son, and the two Spirating/breathing forth the Holy Spirit or the Holy Spirit proceeding from the Father and Son. 5. The Work outside (OPERA AD EXTRA) is summed up in: CREATION, REDEMPTION, and SANCTIFICATION. 6. The Persons act in perfect unity. Though there are some actions ascribed to PERSONS in God: e.g. the Father Creates, the Son Redeems, and the Holy Spirit Sanctifies. However, the Father does not create without his Son (WORD), the Son does not redeem without His Father, and the Holy Spirit does not sanctify without the Father and the Son. 8. 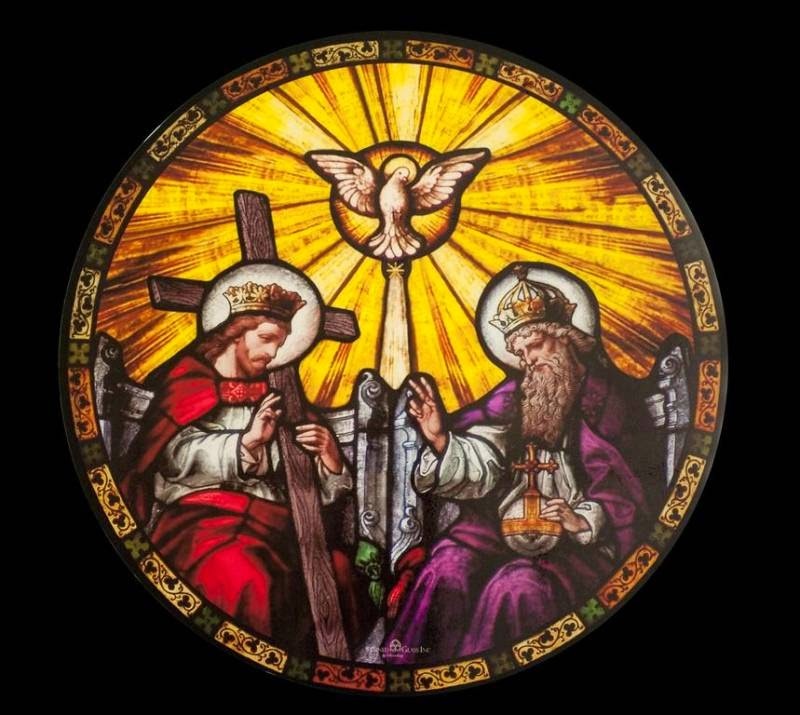 The Mystery of the Blessed Trinity does not mean we CANNOT KNOW ANYTHING ABOUT THIS, it means we cannot understand PERFECTLY. For instance WE KNOW there are 3 Persons but cannot UNDERSTAND PERFECTLY what this means. 9. The Blessed Trinity is One in Nature, Power, Existence, Authority, Majesty, and EVERYTHING but their Personhood. They are One in all things but only DISTINCT (Do not use "Different") in their Person. # You may Add your own Points from Catholic Doctrine/Theology. Or you may ask questions. A good sister asked for "evidence" for the validity of the immaculate conception dogma. Evidence is simply that God dwells in the holiest of places and if he ever came into the womb of Mary (which he did), he must have prepared it free from every stain of sin. Her womb, like heaven became unstained with even the slightest taint of original or actual sin. Again if Jesus were to save us from sin, he too would not be affected by original sin. If Mary were affected by original sin, then Christ too would have suffered this too and would therefore be unable to save Us since he himself would be in this sin with us. However if Christ would save he needed be outside this pit of sin to draw us away from it. And Mary's immaculate conception was a way for Christ to be free from this sin and be in good position to draw us from it. Plus, he also has revealed this truth to the Church over the years. WHEN THE INQUIRER ARGUED "So the Dogma is based on assumption?" We Replied : the explanation i have previously given you is pretty enough for someone who asks question to understand. I mentioned "revelation" in my explanation so i do not know where your "assumption" comes from. Probably you need to read the text better. The matter is very clear, God has given us power to discern what he will and won't do, this kind of argument is drawn from REASON. God also has given us the gift to believe what he says to us even if we do not understand them, this is called FAITH. The Dogma of the immaculate conception is both supported by reason and revealed by God himself (Faith). The Faith of the Church is that God being all Good, Perfect cannot have any taint of sin,and since he has all the power, he actually makes it that sin has no place in his incarnation, this is simple logic. 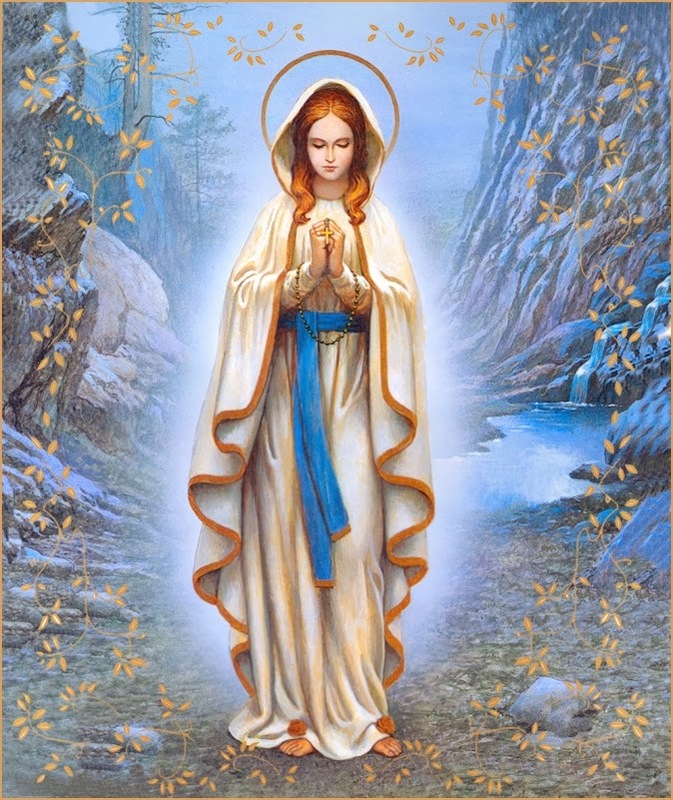 He also has revealed this truth to his Church by the Magisterial Authority bestowed upon her and by the Apparition of Lourdes which confirms it. Therefore, What we have merely thought as possible throughout the history of the Church, God himself has confirmed by the gift of revelation. The Priest Forgives sins through the Power of Christ acting in him; he is a sharer in the Divinity of Christ. You say i have spoken abomination? I tell you, you yourself do not understand the meaning of Sacaramental Power. At baptism, a human being acts in the Name of Christ and His Church in infusing divine life in an infant. You say the priest should not be made to look as if he can do what only God can (which is forgiving sin), yet it is clear that God wants man to participate in things he alone can do. The humanity of Christ introduces the possibility of God sharing in man's actions and Man sharing in God's. When at baptism a Priest, or even you yourself say "I baptize you" what does this mean? You give life to another soul ! And bear in mind that ONLY God can give life, yet you can also give this life because you share in it; because God has given you the power to give this life. "Giving life" here simply means acting in the stead of Christ in the sacramental celebration. Mind you he said "YOU FORGIVE" not "You tell them i forgive" he said "YOU FORGIVE" showing it is actually the Priests who carry out this mission of forgiveness in his place. If you say its a lie, then why did Christ speak those words in the first place? or was the Gospel lying as to its meaning? 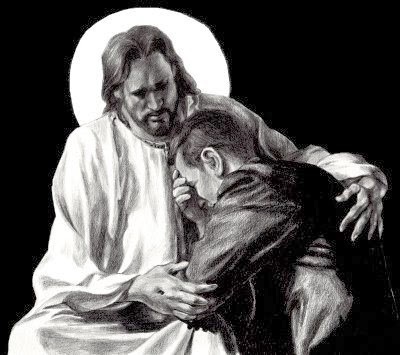 Confession has been practiced right from the beginning of Christianity, Msgr. Louis Gaston de Segur even traced its origin to the Jews before Christ. The Jews confessed their sins to the priest who in turn would offer atonement sacrifice for the penitent. There are many documents written by early Christians containing teachings on confession and absolution from priests. They seemed to have no problem with this, until some "KNOW-IT-ALL" protestants began to redefine teachings that has always been clear; confusing people who have little or no instruction. They BROKE away from orthodox Christian practice in their quest to be more christian, they believed they were wiser and better than billions who have died for this faith; that they were the "chosen" ones to whom God revealed a "secret" teaching. Never doubt unless you have researched well on this else you will be like many others who have rejected sublime truths simply because "they did not like them" not because they were unreasonable or false or contradictory.